World's Fastest & Most Flexible Video Editor! PLUS Over $650 Value Premium Effects! 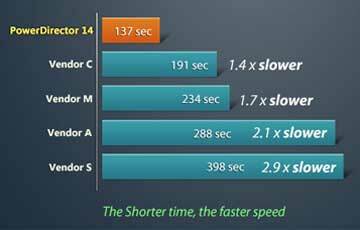 PowerDirector 14 is an unbelievably fast and flexible Windows 10 video editing software solution, offering an unique combination of high-end performance and advanced video editing features. Its intuitive interface makes it a video editor accessible to users of all skill levels, from beginners to experts. A huge selection of customizable design tools, including unique alpha transitions, animated titles, particles and PiP objects, give you the freedom to explore your creativity and reflect it in your video creations. Create transitions from any image using alpha channel masks to set the shape. Fade in/out effects can be set with keyframes. Select from more than 20 effects, then customize the motion, font, color, border, blur, transparency and reflection. Personalize menus with titles, chapters, particles and PiP objects to match your own unique flair. The PiP Designer provides a set of transforming tools that allow you to create and control PiP objects in your video. Synchronize up to 4 video clips by audio content, and perform real time mixing of video clips, without the need for keyframes. Be Different! Choose from 500+ Effects! PowerDirector is a well-equipped movie maker software, which provides over 500 built-in pro-level effects & templates, including video effects, transitions, titles, particle effects, animated PiP objects and all new pre-designed Express Projects. You can also customize your own effects or access unlimited free effects from DirectorZone! The Action Camera Center is an extreme toolkit making PowerDirector the best video editing software for action sports and high speed videos. It provides a powerful set of features specifically designed to satisfy the requirements of action sports enthusiasts and those who film them. Motion Tracking feature allows you to easily track the size and motion of moving objects in video, which can be a complicated task in other video editing software. TrueVelocity 5 is a powerful 64-bit rendering engine that leverages hardware and software technologies to speed up video processing and outperform competitors. With TrueVelocity 5, PowerDirector is optimized for modern CPU and GPGPU hardware platforms to maximize memory allocation and usage, which makes it the best Windows 10 video editor for you. SVRT (Smart Video Rendering Technology) is a proprietary technology from CyberLink that reduces rendering time with no loss of production quality. With resolution up to 3840 x 2160, you can create crystal clear videos in resolution 4 times higher than Full HD. Unique processing technology allows for hassle-free import, preview and export of super high frame rate video. Just getting started in video editing? CyberLink Learning Center is here to help you to sharpen your media creations. Join now and learn editing tips and tricks from our experts every 2-3 months! PLUS Over $900 Value Effects! PLUS Over $650 Value Effects!